Kids in the Biosphere Booklet – get yours today! Have you practiced searching for animal signs in your backyard? Have you given a helping hand to a species at risk? Have you collected photos of your neat nature findings? If you own the first edition of the Kids in the Biosphere Activity Booklet, your answers to these questions will be “Yes!” Released by the GBBR in 2014, this booklet was a great success, 1000 copies were sold! Four years later, GBBR is continuing to help connect youth with all that Georgian Bay has to offer with a second edition of this kid’s booklet. 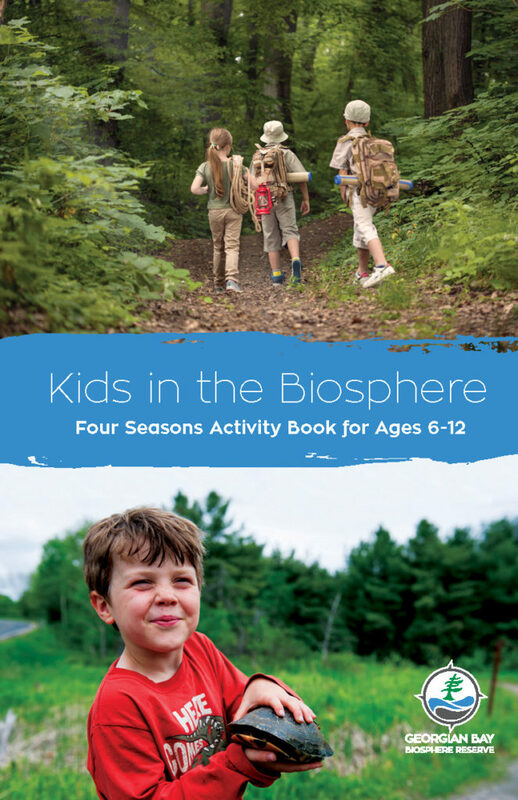 The Kids in the Biosphere Four Seasons Activity Booklet contains over 70 pages of new and classic activities, plant and animal info and identification guides, as well as space to write and draw observations and ideas. New to this booklet is the Kids are Climate Champions section with ways families can shrink their environmental footprint at home. Indigenous knowledge shared by the Anishinabek people include stories about Turtle Island and the Four Directions. The booklet encourages kids to repeat the self-guided activities each year to see how their findings change. The Kids in the Biosphere booklet is only $10 and available from the Biosphere office, 11 James St., Parry Sound. Perfect for gift shops, visitor centres, marinas, resorts, summer camps, cottage associations and more! Interested in being a distributor? Email us!